Do you ever have that one recurring dream: every night? Every few days? Every week? Month? Couple of times a year? That dream… you know, the one that comes in different forms but is always the same? A year could pass by before you have it again but you know, deep in your soul when you have it, that it was that dream. This is my dream, I am always running from the storm. For years, my subconscious mind replays this dream in different versions as if I am watching a new screening of an old movie. It begins with panic. “Run!” as I am spritning for shelter somewhere. A tornado is coming and it’s a big one. Always. Always a big one. There is wind and it is dark and I am running for shelter. Interestingly enough, I am always with my family (mom, dad, brother) but never with my husband. The next scene flashes and miraculously we have found shelter: a mixture of walls from my imagination, from my childhood home in Venezuela or places that I have seen in real life. In the next scene, we are watching the storm pass by in a way that would never be safe. We look out a window as a tornado passes us and we are untouched. Unharmed by the night’s events, the dream ends. I wake up feeling panicked but relieved. Whatever is trying to harm me, won’t. I feel the comfort of being protected and then gratitude as I fall back asleep. Another night’s slumber comes and again we find ourselves in this situation – running from the storm. Different location this time but same characters. Again we are unscathed. On and on and on it goes, different night, different storm – always running but never harmed. One of the things that I love about creating images like this, is the ability to recreate a concept from my dreams. We all have pretty interesting dreams – some of us have crazy and intense dreams, some scary, some calm, some loving, and some that we don’t remember. I believe that our dreams are meant to tell us something about our real life. 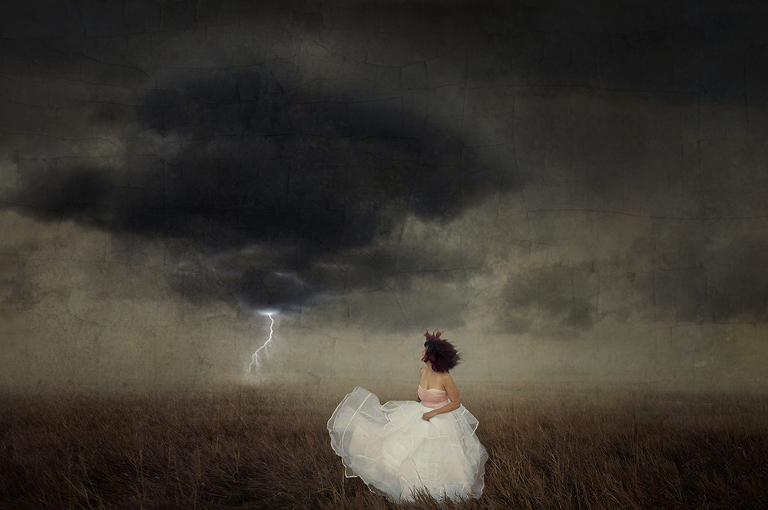 I am just always grateful that if my storms represent issues and problems, that I come out on the other side untouched.